A property that has a good looking garden has a higher sale value than the one which does not have one. Besides pushing up the sale value of your property, it is also a source of happiness to know that the outside world that you look out at every day has the perfect shine to it. However making that view look astounding is not an easy task. We’re always busy at work or involved doing other things that gives us no time sort out the problems within our garden, despite our best intentions. Our Edinburgh based Landscape gardeners can help you change that. This is because we have the knowledge about the small ‘nitty-gritties’ that can make your garden great again. One must be aware of the fact that good garden design does not only mean getting a patio area or choose a nice space for the bedding plants. It is more about converting your garden into a beautiful and useful space that is coherent with your home. 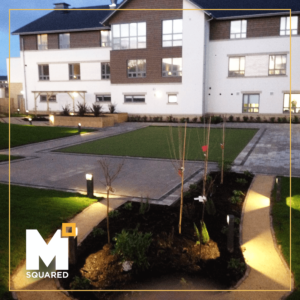 At M Squared we have the expertise to create gardens that will be a source of joy to our customers for many years down the line. We have the proficiency to reshape your garden, exactly the way you would want it and incorporate the features such as decking, patios artificial grass, or even plant beds. A vital aspect that ought to be kept in mind is that even if you have a small piece of land outside your home, it is possible to make it into a wonderful garden with the right kind of careful planning. The big advantage of getting in touch with our Edinburgh based Landscapers is that our work does not stop just after they have reshaped your garden. We offer great maintenance services to ensure that your garden stays in the perfect shape, exactly the way you like it. We will do everything that is necessary to maintain your garden in the best of condition so what are you waiting for? Give us a call and we’ll have a chat about your project today! You can contact us using the number below or message us for a free site survey.